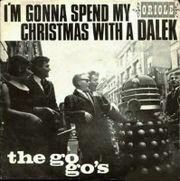 One with a cold, it seems when you listen to this frankly awful, but somehow wonderful Christmas single. Daleks’ voices are done electronically (I hope I’m not spoiling the magic there) – not here it seems. This entry was written by Jon Bounds, posted on 24 December 2007 at 10:22 am, filed under found stuff, music and tagged 60s, Christmas, Dalek, music. Bookmark the permalink. Follow any comments here with the RSS feed for this post. Post a comment or leave a trackback: Trackback URL.